Vice presidential candidates Ma'ruf Amin (C) and Sandiaga Uno (L) sign a document pledging to run a peaceful campaign at the National Monument in Jakarta, Sept. 23, 2018. 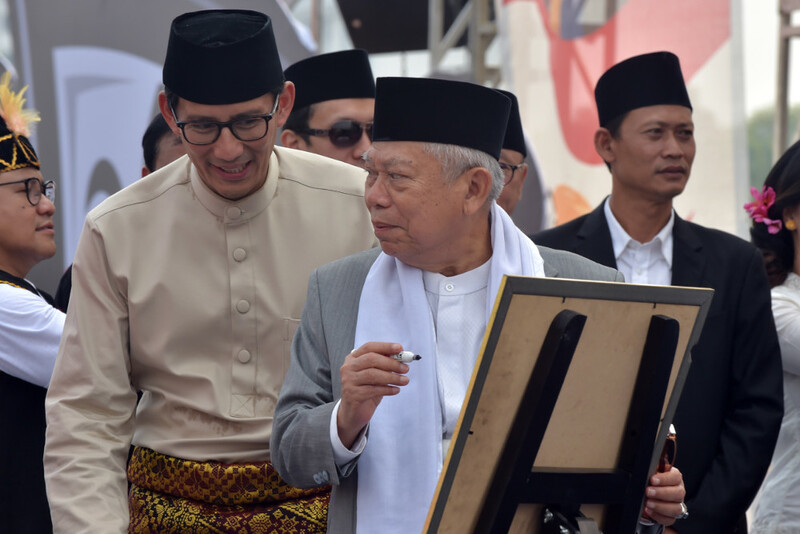 Jokowi picked Ma'ruf Amin, the conservative 76-year-old chairman of the Indonesian Council of Muslim Scholars (MUI), for his running mate, apparently aiming to bolster his religious credentials amid accusations from hardline Islamic groups that he is hostile to them. During a televised debate between Ma’ruf and Sandiaga on Sunday, the two avoided engaging in heated arguments on key policy issues.